I spent the last three years as Product Philosopher at Google, where I studied how technology affects people’s attention, wellbeing, and behavior. 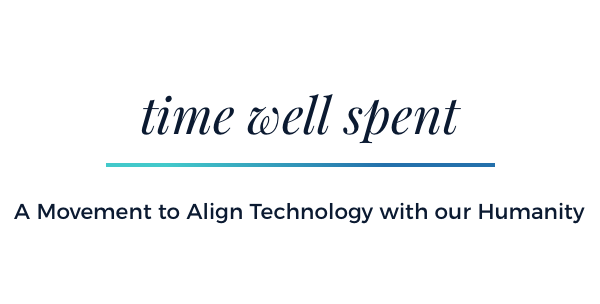 I left recently to work on a social movement for technology called “Time Well Spent” — for a new class of tech that’s about minimizing distractions, supporting mindful choices and helping people live the lives they want to live — not maximizing screen time. It’s similar to the way the organic food movement created a new market for healthy and sustainable food. Which are your Tools? Specifically, which apps help you with specific end-to-end tasks (and never “leak out” into unintended distractions)? And of these, which do you rely on frequently? Good examples are apps like Camera, Notes, Calendar, Maps or Uber— but not Email. These are apps that you drive, but they don’t drive you. Move everything else– the Bottomless Bowls, Slot Machines and all other apps — off the first page of apps. I’ll explain in a second. The fewer the number of icons our eyes have to scan when we unlock our phone, the less work our mind has to do. Yup, it’s called typing. While you can use muscle-memory to unconsciously move your thumb to open an app without thinking, it’s actually impossible to type on a keyboard unconsciously. Do you ever unlock your phone to do something specific — like take a photo, or set an alarm — and then somehow get sucked into an hour of unrelated distractions? This is especially challenging at bed time, when “quickly” setting my alarm somehow turns into an unexpected binge on Facebook or YouTube. Put all your other apps into folders on the second page and don’t worry about stuffing too many apps together. If you’re following Tip #2, you won’t need these apps visible as separate icons anyway, because you’ll be typing their name instead. The result? The new choice architecture reduced the consumption of M&M’s by 3.1 million calories in just seven weeks, in Google’s NY office alone — the equivalent of nine fewer vending machine-sized packages of M&Ms per employee. And they didn’t take any candy away, they just re-organized the existing choices. We live in an Attention Economy. That means every app and website — whether it is a meditation app, the NYTimes, or an addictive game — is trying to get you to come back and spend more time. Companies literally have teams of people called Growth Hackers, whose job is to invent new reasons (notifications) and new persuasive tactics to bring you back. I know this because I studied with the lab at Stanford that invented many of these principles. Gloria Mark, one of the leading researchers on “interruption science” at UC Irvine, has shown that unrelated external interruptions cost us 23 minutes before we resume focus. And it appears that the more interruptions we get, the more it increases our internal clock rates for self-interruption– put simply, the more we get interrupted, the more we interrupt ourselves. But what about social media — what if I was tagged in a photo or miss an event? Like email, why not check these sites and find out about important events or notifications on your terms — not theirs? Rest assured, they usually find a way to email you about them anyway. Today when our phone buzzes, it could be anything: we’ve been tagged in a photo, our mom’s texting us about an emergency, or someone followed you on Twitter. Our phone vibrates in a similar way for each type. This leads to the phenomenon of “phantom buzzing” — where we’re not sure if that person we’re expecting got back to us or not, and we start feeling vibrations in our pocket that didn’t even happen. Both Apple and Google could do a lot more to make our phone’s default settings reflect how people really want to live. Imagine if we lived in a world where our phones and the Internet were designed to make our darwinian instincts work for us, instead of against us. Imagine if these kinds of settings were the default, not something only a few people knew about. Tristan Harris was Product Philosopher at Google until 2016 where he studied how technology affects a billion people’s attention, wellbeing and behavior. For more resources on Time Well Spent, see http://timewellspent.io. Originally published at www.tristanharris.com on January 27, 2016.